This doesn't happen but once in a great while. "Hi. If anyone ever wanted me to do any sketches or any art at all, this is the time to get it. I have some time on my hands. I'm not saying I'll do anything at all. I'll do my job on whatever it is, and do it right. I can be reached at craig@alteredearth.com or FB or Pony Express, any way at all. 411 will work on me too. I don't have any work for now. Blah. I'll do a nice con type sketch for $40. I'll still put my heart into it even for that. If folks have a budget for other kinds of things, I'll work things out with them and make some nice stuff." From me to you. If you don't take advantage of this opportunity, you're a big dumb idiot. Hell yeah, already set one up! i about pissed myself when i read this! i just emailed him with my request. i'm praying that he'll be able to squeeze me in. i've been wanting a piece of art from him for a VERY long time. And his price is insainly reasonable! WOOHOO! thaks for passing the word Archon! Just saw this... thanks for posting Archon! I'd like something, but since I'd be spending money, I'd like to see examples of what his 'convention sketches' look like. I know he's on my list of artists to get a commission from, but I forgot what his work looks like. And it's awesome he's doing some. I hope to get in there. Yeah, anyone have examples? Id like to get one done on a Detroit Fanfare Blank. Does the $40 include color? I contacted him within 2 minutes of that status being posted. Already worked something out. I asked him a while back if he'd do a picture of the 4Kids TMNT for me, but he prefers the Mirage universe, so I might come up with a different idea for him. I sent an email, hope I can get worked in. He's probably been bombarded with requests though, so here's hopin. Right after I posted I checked my email and he responded. Just got to pay and he'll start. Last edited by Plasticplayhouse; 08-23-2012 at 12:02 PM. Arranged mine on day one, just paid now. Sweeeeeeet. I've been trying to get something from him for like 3 years. I also jumped on this right away. Quite excited. I contacted him about a movie poster for my new film. He's interested but we need to get the cash together to pay him proper. What should I expect from this? I asked for just a turtle and however he wanted. He said 50 and 9 x 12 ink on paper. The only demands I made are Michelangelo with his mask hanging around his neck. Nah, I'm sure he don't mind. 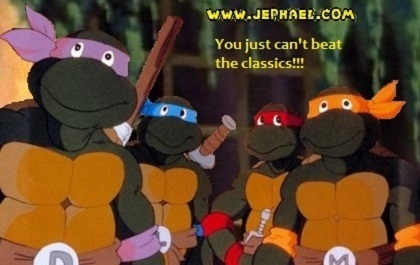 I actually asked for Raph and told him I don't care what he's doing or anything like that.